A pork and veggie stir-fry that's on the table in 20 minutes? 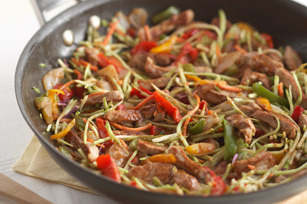 You bet - our Rush-Hour Pork Stir-Fry recipe combines pork tenderloin, prepared veggies and a simple sauce for a convenient skillet supper. How's that for a quick recipe to get you out of a jam? Add frozen vegetables; stir-fry 5 min. or until heated through. Stir in dressing, soy sauce and garlic powder; cook on medium heat 2 min. or until heated through, stirring occasionally. Remove from heat. Substitute boneless skinless chicken breasts or thighs for the pork. Help your friends and family eat right with this Asian-inspired dish. As a bonus, the stir-fry vegetables and broccoli slaw team up to provide a good source of vitamin A.